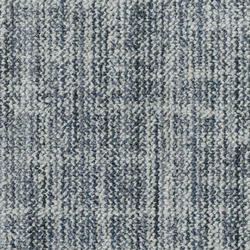 A modern style-setter, DESSO Jeans is a new carpet tile that brings depth of character in contemporary inky hues. For many, denim represents comfort and personal style – it is the archetypal wardrobe item. Taking its inspiration from entrepreneurial companies, DESSO Jeans bring a sense of familiarity – and democracy - to offices reflecting the changing workplace with flatter organisational structures and new ways of working and collaborating. DESSO Jeans features six stunning denim-inspired shades in three different structures to zone or create large spaces through different textures and subtle patterns. From a light stone-washed effect to a distinct denim woven look, designers can coordinate and contrast in three different pattern combinations to set a dynamic tone in the workplace. The irregular nature of DESSO Jeans gives the space character and a sense of identity to create spaces where people feel comfortable to collaborate, focus – and relax.